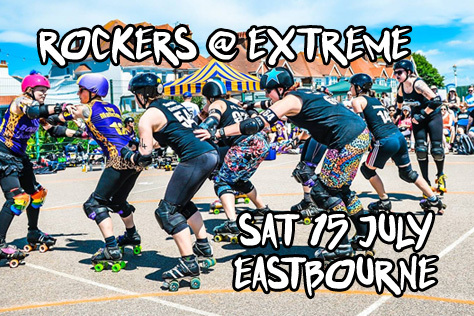 LIVE DERBY OUTDOORS – Two Rockers Teams At EASTBOURNE EXTREME This Saturday! The mighty Rockers have a super busy summer ahead. On August 5th they will be skating in the Brighton Pride parade. On July 22nd (Saturday week) they’ll be hosting a special fundraising music and quiz night at the Latest Musicbar – see the links below for details. Before both of those events, however, this very weekend they will be taking part in Eastbourne Extreme. 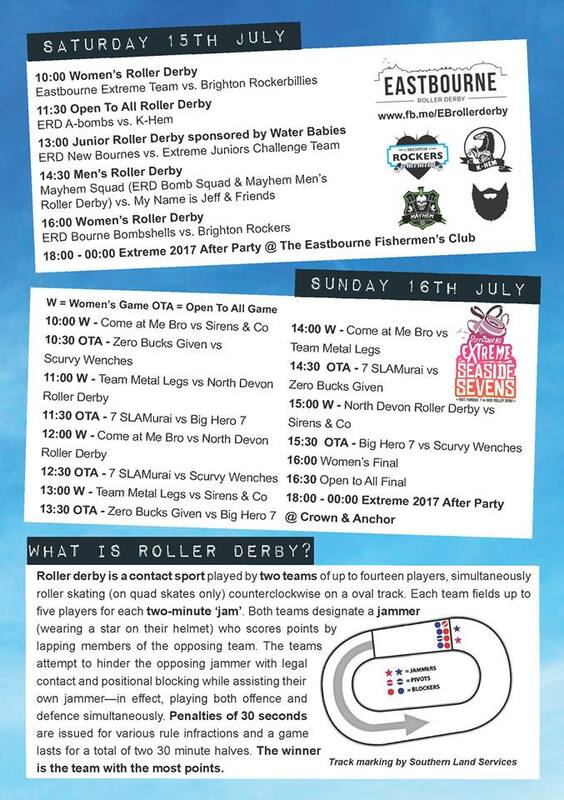 Europe’s only outdoor roller derby tournament takes place over two days (Saturday and Sunday) on Eastbourne seafront. This year the Rockers A-team and B-team will both be in action on the Saturday. That’s this Saturday, July 15th. The B-team Rockerbillies kick off proceedings with a game against a specially formed Eastbourne Extreme Team (players from a variety of leagues) at the early hour of 10am. The A-team Rockers AllStars will take on Eastbourne Roller Derby’s Bourne Bombshells at 4pm. In between there are games featuring Eastbourne’s men’s, juniors and co-ed teams, with two sevens tournaments (women’s and open to all) on the Sunday. See the flyer halfway down this preview for the full schedule. The event takes place on public sports courts at Fisherman’s Green on Eastbourne seafront, roughly halfway between the Pier and Marina. Admission is totally free for spectators, with toilet facilities and food outlets close by. You can bring in your own booze etc – there’s a Spar, Tesco Express and Co-op about four minutes walk inland – and sun cream is advisable. There’s a ticketed after party (£8) right by the derby venue on the Saturday, whilst Sunday’s (free entry) is at the Crown & Anchor pub near the Pier. Trains from Brighton to Eastbourne are at 32 and 52 past on Saturday. The 32 is much faster (takes half an hour) but is usually only two carriages and can get quite busy, so arrive early for a decent seat. A day return is £7.20 with a railcard or you can get the number 12 bus (which takes much longer) for £6.50 return. The venue is around 25 mins walk from the train station. Point your map app at BN22 7AA. There’s a big car park adjacent (£4.80 all day) as well street parking on inland side streets. [Skip this section if you don’t want to know how the prediction sites expect these games to go.] Since the Rockerbillies are facing a challenge team specifically created for the event, we have no way of predicting the result of that one. As for the Rockers v Bombshells contest, using the UKRDA rankings on Flattrackstats the Rockers (23rd place on 595.0 points) are huge favourites over the Bombshells (58th on 422.7). Brighton are given 98% chance of victory with a 26:5 differential working out as something like a 260-50 Rockers win. The European rankings on FTS have the Rockers 72nd (593.4 pts) and Bombshells 233rd (479.3). Using these figures the prediction drops slightly to 95% chance of a Brighton win, with a 29:10 differential suggesting a 232-80 type scoreline. Last month’s trip to Ireland resulted in two Rockers wins: 173-157 v Limerick and 453-65 v Belfast. That Belfast result is Brighton’s biggest points haul and margin of victory EVER. What are your thoughts on those games (and the trip overall) and were you expecting such a big win? Aren’t we the best!? Still on a massive high from that weekend. We knew Limerick was going to be the tougher game, so to get that win under our belts first meant we were on cloud nine. We went into the Belfast game super confident. We had been working really hard for months on our defensive walls and offence. To see it all come together brilliantly in those games was so satisfying. The weekend as a whole was cracking; we managed to survive our murder house accommodation and snagged the only hot sunny weather Ireland has seen since 350BC. This Saturday sees both the A-team and B-team in action outdoors at Eastbourne Extreme. The Rockerbillies face a mixed league opposition at 10am. Any thoughts? I’m expecting big things from our Rockerbillies! Their skills have really developed over the past few months especially, and they are now playing at a really competitive level. One of their major strengths, I think, are their derby brains; they are super switched on when it comes to tactics and reading the game. The A-team face the Bourne Bombshells at 4pm in probably the highest profile game of the entire Extreme weekend. What are you expecting from that contest? I don’t really like to go into games with any expectations. I just want us to play our best game and the results will be what they will be. We haven’t played Eastbourne in a very long time, and most of us haven’t skated Extreme before so it is a bit of an unknown. They are our derby neighbours though and we know each other well so it is going to be a fun game to play for sure. How does playing roller derby outdoors on tarmac differ from games in sports halls? Well, I’ve skated outdoors a whole bunch of times, but never actually played derby outside. I’ve been wanting to play Extreme for a long time to have a chance to try it out. I imagine sharp stops are going to be interesting. I know we get to wear sunglasses, which is fabulous. What are your expectations for Eastbourne Extreme in general (both on and off track)? I’ve been to Extreme a bunch of times and it is always such a great day out. Sunshine, skating, seafront – what else could you want?